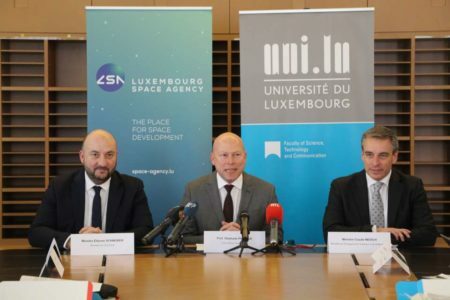 In September 2019, the University of Luxembourg will launch a two-year interdisciplinary Space Master programme. The aim of the programme is to generate a talent pool of highly skilled engineers and innovative entrepreneurs who will be able to create and manage leading commercial space enterprises. Over the past 30 years, Luxembourg has become home to a dynamic and expansive space sector, spearheaded by satellite giant SES. After launching the SpaceResources.lu initiative in 2016, the country has also attracted a growing number of “new space” companies engaged in the exploitation and use of space resources. The Space Master programme, which has been set up by the University of Luxembourg in collaboration with the Luxembourg Space Agency, will contribute to developing the specific skills needed to pioneer a new and sustainable space industry in Luxembourg. This unique Master programme aims to give participants who already have an engineering or scientific background additional technical expertise in areas needed to support Luxembourg’s space industry. The programme will offer an innovative mix of business and technology teaching and span from rocket science to the management of space businesses. To ensure that the programme meets business requirements, it has been developed with input from important national and international public and industry players in the space sector. Some of these companies endorse the programme by offering internships to students. “We have had very good feedback about the way the programme is designed,” Professor Pallange confirmed, and underlined that “we are confident that we will have a very nice cohort of students starting in September”. FNR and Ministry of the Economy to launch a "Space Research Programme"
Deputy Prime Minister, Minister of the Economy, Étienne Schneider, and Secretary General and Executive Head of the Luxembourg National Research Fund (FNR), Marc Schiltz, signed an agreement to develop a programme to support research for the commercial space industry in Luxembourg. SES was successful in its application for the European Commission flagship-funding programme for Research and Innovation, Horizon 2020. This long path to H2020 success originates from a close cooperation with Luxinnovation!